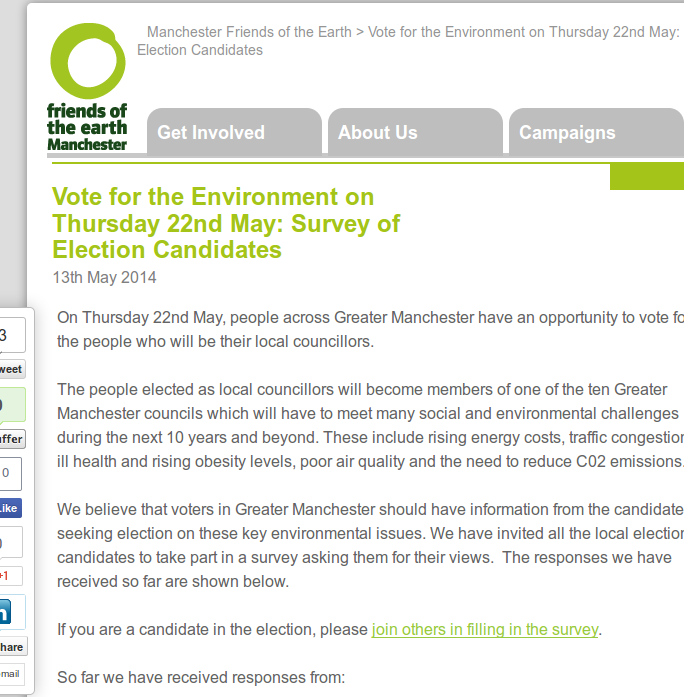 Manchester Friends of the Earth has, again, performed a useful public service. They’ve set up an online survey for candidates in the local elections, happening on Thursday May 22nd. The questions revolve around the candidates’ positions on Energy and Climate, Sustainable Transport, the Expansion of Manchester Airport, bees and biodiversity. At time of posting this, 5 Lib Dem candidates, 18 Green candidates, 5 Conservatives, 1 Independent (Pirate Party – thanks to sharp-eyed reader Joe for correction) and … 2 Labour candidates (one a sitting councillor, one a candidate) have bothered to tell Manchester’s voters what they think. You can encourage candidates from ALL parties to fill in the survey, which is here.